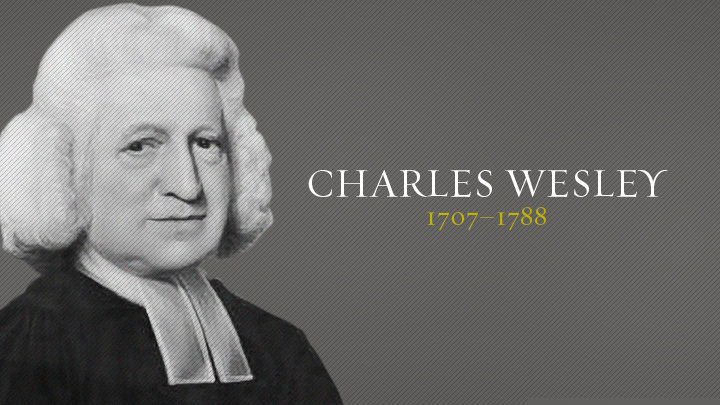 Charles Wesley was the eighteenth of Samuel and Susannah Wesley’s nineteen children (only 10 lived to maturity). He was born prematurely in December 1707 and appeared dead. He lay silent, wrapped in wool, for weeks. When older, Charles joined his siblings as each day his mother, Susannah, who knew Greek, Latin, and French, methodically taught them for six hours. Charles then spent 13 years at Westminster School, where the only language allowed in public was Latin. He added nine years at Oxford, where he received his master’s degree. It was said that he could reel off the Latin poet Virgil by the half hour. In 1735 Charles joined his brother John (they were now both ordained), to become a missionary in the colony of Georgia—John as chaplain of the rough outpost and Charles as secretary to Governor Oglethorpe. It turned out to be the Moravians. After returning to England, Charles taught English to Moravian Peter Böhler, who prompted Charles to look at the state of his soul more deeply. During May 1738, Charles began reading Martin Luther’s volume on Galatians while ill. He wrote in his diary, “I labored, waited, and prayed to feel ‘who loved me, and gave himself for me. '” He shortly found himself convinced, and journaled, “I now found myself at peace with God, and rejoice in hope of loving Christ.” Two days later he began writing a hymn celebrating his conversion. At evangelist George Whitefield’s instigation, John and Charles eventually submitted to “be viler” and do the unthinkable: preach outside of church buildings. In his journal entries from 1739 to 1743, Charles computed the number of those to whom he had preached. Of only those crowds for whom he stated a figure, the total during these five years comes to 149,400. From June 24 through July 8, 1738, Charles reported preaching twice to crowds of ten thousand at Moorfields, once called “that Coney Island of the eighteenth century.” He preached to 20,000 at Kennington Common plus gave a sermon on justification before the University of Oxford. On a trip to Wales in 1747, the adventurous evangelist, now 40 years old, met 20-year-old Sally Gwynne, whom he soon married. By all accounts, their marriage was a happy one. Charles continued to travel and preach, sometimes creating tension with John, who complained that “I do not even know when and where you intend to go.” His last nationwide trip was in 1756. After that, his health led him gradually to withdraw from itinerant ministry. He spent the remainder of his life in Bristol and London, preaching at Methodist chapels.